Miller-McCune magazine points out today that we’ll soon have new CAFE fuel standards. EPA and the Department of Transportation announced their proposed new rules on Tuesday, and in an effort to find something interesting to say about them I present you with this chart. 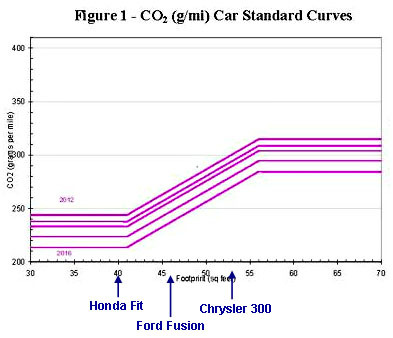 If the fooprint approach works the way it’s supposed to, we’ll reach a fleet average of 35 mpg by 2016 instead of 2020. Time will tell.